Looking for a gift under $25? 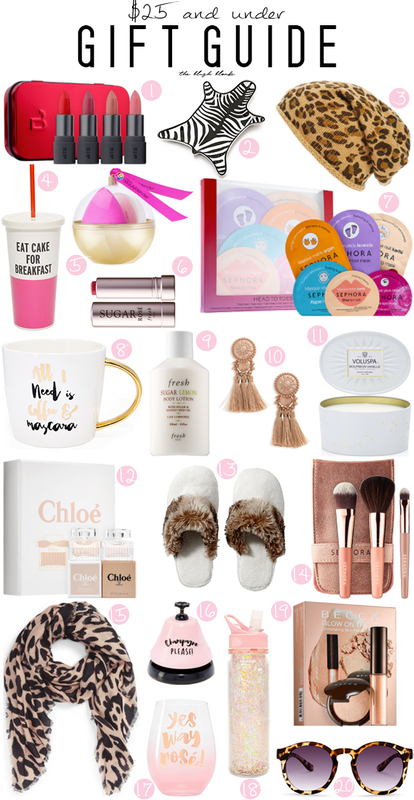 I've got you covered here with twenty adorable presents that any lady in your life is sure to love! These are great for coworkers, friends, or anyone else you want to give a little something special to. They are a sweet way to show your love and appreciation without spending a ton of money. You can also pair a few of these items together for a bigger gift or even add something small to an item, like filling this with a package of the recipient's favorite coffee, tea, or hot chocolate. I personally love all of these gifts, but I need these slippers in my life (my feet are always cold! ), I'm obsessed with these earrings, and this lip balm is my absolute favorite. No matter which ones you pick any of these will make for a fun gift and are sure to make a big hit! I am loving all of these gift ideas! The Sephora mask set is such a great gift! I'd love to get it for the holidays. Loving all of these and the fact that it's all less than $25! All of these gifts are totally adorable. I love Bite lipsticks and I can't believe that brush set is under $25! I just shared those Bite lipsticks on my Facebook page today because you can't beat that selection for under $25! And who ever goes through a whole lipstick anyways? One of my best friends is such a Sephora fanatic, so I'll have to buy her these masks! Sephora is my favorite place to get stocking stuffers! Love these picks!